You are here: Home / Cat Behavior / How Can I Deal With My Cat’s Fear At the Vet? What can Joan do to help her cat deal with her fear at the vet? We’ve got some answers! Wondering if you might have some advice regarding fear at the vet. My 18-month-old Bengal, Minx, is so terrified of the vet that it is nearly impossible to examine or treat her. I’ve had her since she was three months old, and at home with me, she is as compliant and easy to deal with as a little dog: I can give her pills, eye drops, etc., with minimal effort. She is a scaredy-cat with strangers, however. At our most recent visit, it took four people to restrain her sufficiently for a simple ear exam. I take her to a cat-only, certified cat-friendly clinic. She isn’t afraid of the carrier; if I put it in the hallway, she hops right in it just for fun. I have had a vet visit her at our home, and results were similar. The vet has suggested sedation with gabapentin. I’ve tried using pet-safe CBD oil as an anxiety reducer, and although she was pleasantly high at home, the adrenaline overrode it the minute we got to the vet. We may have covered all the available options already, but I’d like to know if there’s anything else I might not have thought of. Thomas: Fear at the vet is one of the most common reason cats don’t get to the vet as often as dogs. It’s pretty stressful for a person to catch a cat, get them in the carrier, deal with the howling and crying all the way to the vet, and then face the panicked behavior at the office. Bella: You’re fortunate that your cat likes the carrier and doesn’t have any trouble getting in it. We’re good kitties, too, and we get in the carrier easily. Tara: But we do make our displeasure known when we’re in the car on the way there. Bella: That’s me getting out of my carrier at the vet’s office up there in the photo! Thomas: Anyway, Joan, we do have a few things we could recommend in helping you alleviate your cat’s fear at the vet. The first thing we suggest is that you try some Feliway Comfort Zone spray in your cat’s carrier. This synthetic “happy cat” pheromone helps to reduce stress. 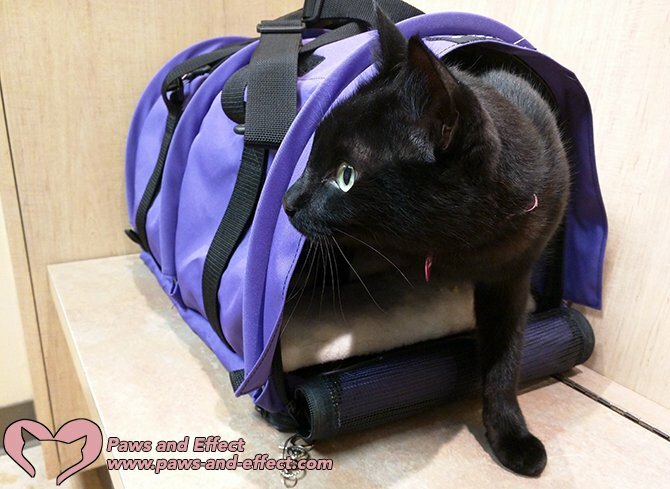 Bella: We know your cat doesn’t have a problem with the carrier, but we think that having some happy-cat pheromones lingering around might make it easier for her at the vet. Tara: Another thing we suggest is that you take her to the vet’s office for something other than an exam. Just drive her over there, take her in for a visit, have the receptionists ooh and aah over her, and then go back home. Thomas: By doing so, you might be able to desensitize your cat to the vet’s office. Bella: Another thing you could do is to give her treats she loves–but only give them to her at the vet’s office. Tara: That may help to relieve your cat’s fear at the vet by creating positive associations. This will work especially well if she’s a food-motivated kitty. Bella: And you should know about being food-motivated, Tara. Tee hee hee! Tara: Hey, that’s not nice! Thomas: She’s right, Bella. Be nice to your sister. Thomas: Now, as we were saying…another thing you can do is try to schedule your appointments when the clinic is less busy. That way, there will be less noise and commotion that might be contributing to your cat’s fear at the vet. Bella: And the most important thing of all is that we cats catch your vibes. If you’re stressed or going in worried that your cat is going to freak out, it’s likely that your kitty will pick up on your nervous energy and see that as further reason to be scared. Tara: But honestly, some cats really do need medication. If your vet is recommending gabapentin as a sedative before the vet trip, then we suggest adding that to your pre-trip planning. Thomas: Gabapentin has a pretty low side effect profile, especially at cat-sized doses, so we don’t think it’s going to be a problem if you give it to her before the vet. Bella: Our cousin Abby needs to have special calming medicine before she goes to the vet. If she doesn’t get it, she starts hyperventilating and getting all panicked. Tara: Make sure you give the medication early enough that it will have kicked in by the time you get to the vet’s office. Your vet will probably suggest how many hours before the visit you should give the medication to her. Thomas: Medications aren’t necessarily a bad thing. Some cats need them, just like some humans need them. Tara takes alprazolam every day for anxiety, and we all notice the difference if she misses a dose! Tara: It really does help me. I feel so much better now that I’m on it. Although I was never scared at the vet, it certainly helps me feel better around other cats. Thomas: … by letting her hunt out all of her energy and then giving her a treat, she might stay calm on the way to the vet and once she’s there. Bella: So hopefully by doing all of these things, you’ll be able to help your cat feel better about the vet. Tara: What about you other readers? Have you had to deal with a cat that gets fractious and freaked out at the vet? Do you have some suggestions for her, too? Please share them in the comments!